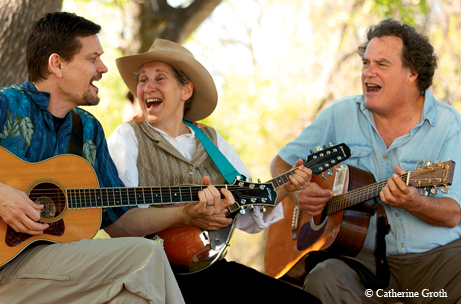 ﻿Texas eco-musicians inspire young naturalists through music. ﻿﻿﻿﻿﻿﻿﻿﻿﻿I’m watching a rapper strut across a well-lit stage. Around me, fans chant along to his call-and-response lyrics, swaying in time to the music. They burst into applause after the number is finished, and beg for one last song. “Throw me your hat!” I hear one girl shout, hoping to score a rare souvenir from this larger-than-life personality. 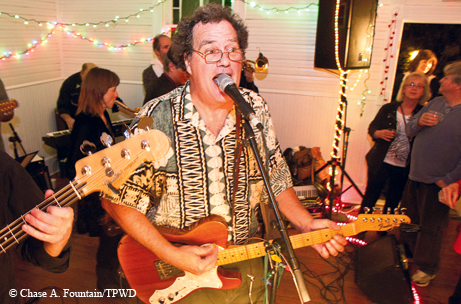 ﻿Miller dubs himself “The Singing Zoologist,” and he’s one of a handful of Texan musicians using their lyrical abilities to teach children about the environment. Count Texan singer-songwriters Purly Gates and Bill Oliver in the fold, too. In addition to performing, Gates teaches children (and families) how to make musical instruments using recycled materials, while Oliver produces two eco-festivals for kids and families: Lady Bird Lake Fest and Mother Earth Day at the Springs (both in Austin). And while all three originally hail from different parts of the country, Texas is where they landed, inspired both by the state’s ecological diversity and the abundance of young audiences. As a member of the manic texting/ tweeting/Facebooking set, I found Oliver’s words refreshing. I often find myself worrying about my future children, and the techy, tinny world that will surround them. Will they go outside? Will they climb trees? I wasn’t exactly raised by the Swiss Family Robinson myself, but I was among the last generation to grow up without the Internet, and I cherish my outdoorsy, sun-streaked youth. Not surprisingly, Miller, Oliver and Gates feel the same way: All three have a deep connection to the children they once were, the ones who still hunger for discovery. I wanted to find out how 21st century kids were responding to their message. Miller and I are chatting on the phone about music. Our conversation has taken a physiological turn. Having played for over 1.5 million children during his career, Miller says this kind of feedback from a young fan’s parent isn’t new — but it’s still thrilling. 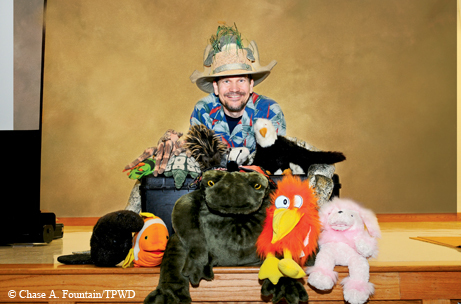 More than anything, he wants to enable kids to make connections in their natural world. Miller worked on the boat while his then-girlfriend (now wife) finished grad school, slowly expanding his repertoire of kid-friendly eco-tunes. They moved to Austin in 1994, leading Miller to a job at the Austin Zoo, hosting birthday parties and leading field trips. It was that gig that earned him his famous moniker, and it wasn’t long before “The Singing Zoologist” took his act on the road. Audiences seem to find him special, too. The National Endowment for the Arts named Miller an American Masterpiece Artist for three years in a row (2008-10), and he has performed twice at the Austin City Limits Music Festival and at the National Zoo in Washington, D.C. Miller’s stage presence channels Bill Nye the Science Guy in a Hawaiian shirt, and his songs marry science with a Shrek-like sense of humor. Crowd favorites include The Mako Shark (which discusses the food chain), Slimy! (which clarifies the texture of a snake’s skin) and The Chimi­changa Song (which is about delicious Mexican food, as well as the difference between carnivores and herbivores). As if being a children’s rock star didn’t keep him busy enough, Miller is also a children’s book author. His most recent book, Bluebonnet Time: An Evan Wilder Science Journal, uses Texans’ obsession with roadside family portraits to illustrate botanical truths about our state flower. One of Miller’s personal idols is Oliver himself, a man who also credits his career to a boat. It’s not a surprise that this would be the man who would help lead the Texas River School, produce nature festivals on the shores of Barton Springs and release an album titled Friend of the River. The last time I watched him perform, it was at a benefit for the Edwards Aquifer organization Save Our Springs. Oliver’s nickname — “Mr. Habitat” — grew out of the song that put him on the musical map. An Internet search for Have to Have a Habitat pulls up scores of YouTube covers 30 years after its release. Oliver wrote the song while taking classes at Austin Community College’s Biology Department, where he was moved to do more with his music — to “take a stand,” as he describes it. It’s a good thing, too: Since he began singing for children in the ’70s, the radius around the home where most children are allowed to roam on their own has shrunk to one-ninth of what it was then. It’s a fact Richard Louv reports in his book Last Child in the Woods. 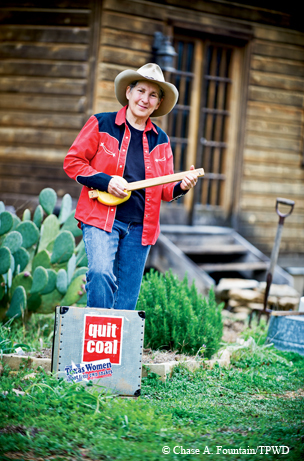 When it comes to the environment, Gates uses her musical know-how somewhat differently. She starts with recycled materials, a do-it-yourself spirit and a burly set of power tools. I went to one of Gates’ instrument-making workshops at the Wimberley Community Center, where a couple of parents, a table full of youngsters and I crafted Brazilian cuícas: instruments that sound either like stepping on a creaky wooden stoop or the mating call of an amorous bullfrog. “Does anyone know where plastic comes from?” she asks the table. “Petroleum. The same stuff they make oil out of,” she explains. A few pairs of wide eyes stare at her. Gates’ easy banter is a quality she picked up performing everywhere from the Texas Book Festival to Disney World. She narrates her craft lessons with stories, telling us how she got the water for our cuícas by traveling to the Amazon River. When it’s passed around for our use, we are so careful we might as well be handling liquid gold. “You can use everyday things for music, you know, like jug bands,” she says. I grin immediately, thinking about Gates with a washtub bass, plucking away in suspenders and a newsboy cap. “Is this a jug?” one girl asks, pointing to her new cuíca. They giggle conspiratorially, thinking about all the old buckets they are about to surprise into a new musical existence.